I can’t help it that Zoë wants to be a superstar. Every time the camera comes out she will do whatever it takes to get those treats I hide in my pocket. That includes smiling on cue and getting cozy with some gifted boots. I am often approached by companies that want me to promote their products. 98% of the time I turn them down, mostly because I’m an avid thrifter and believe that overconsumption of new goods is killing the planet. When Union Jack Boots contacted me though I will admit I was delighted. For years I’ve been eyeing up the rustic Blundstone boots on Queen West. They looked like such high-quality long lasting, forever fashionable boots, footwear that you can sport for twenty years, a rarity amongst the fast-fashion craze. I like products that are meant to last, that don’t wind up in landfills six months later. Did my feet like them? I wore these to the park and they were comfy. They go on quite tight, but once your feet are inside they are roomy. The rubber sole was nicely cushioned which should be fine for my delicate feet and plantar fasciitis. I found them warm, but that is because it was 34 C here today with the humidex. Not exactly ideal boot weather. No worries though, I’m not complaining about this excellent summer weather at the end of September. Soon enough it’ll be winter and this steamy weather will be but a vague dream. I don’t normally take my handbag when I go to the park, I’m not Mariah Carey! but I needed a bag for the camera and since my pug couldn’t be there, this was a good stand in that didn’t chase after squirrels or try to run off with complete strangers that might have more food at their house. It was a challenging photo session. I had to dodge bike riders, hikers, avoid dog crap, crazed squirrels and I was a hearty lunch for about half a dozen starving mosquitos. Oh yeah, and I almost fell twice when branches broke. No one told me as a style blogger I needed health insurance! The boots I chose are the chisel toe Blundstones in redwood. They look a bit redder above due to lighting. They are more of a deep burgundy. What else can I tell you about these Blundstone Union Jack Boots? They arrived super fast, in less than a week which was darn impressive since they are made in Tasmania. And of course the most important thing about these boots? Which of course means they make a brilliant chin rest. 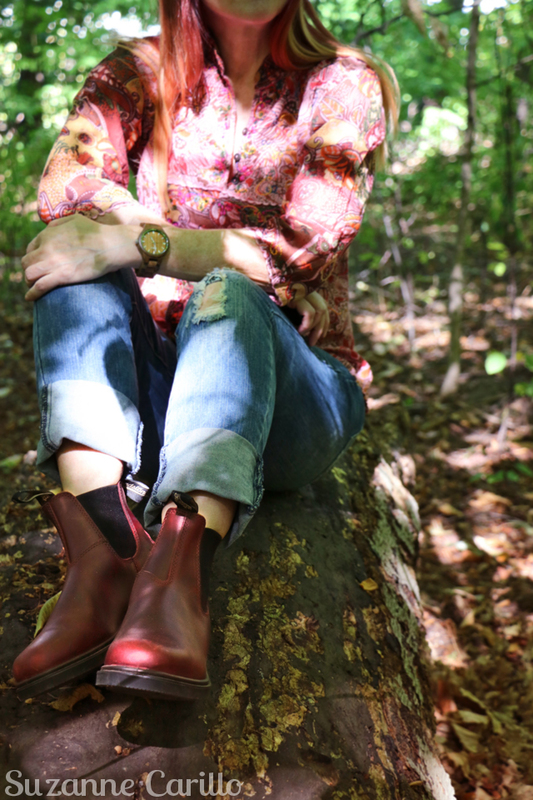 Do you have your eyes on any new boots this fall? Have you heard of Blundstones or Union Jack Boots before? PS This post was created last week when it was still hot outside. Today it is cool and raining. 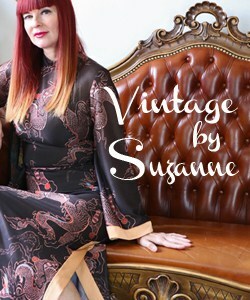 I am busy setting up for the Toronto Vintage Clothing Show! Tomorrow and Sunday are the big days! If you are in the area stop by and say hi! Toronto Exhibition Place Heritage Court Oct 1-2. I will be taking some photos at the show as well and posting them to my Instagram. 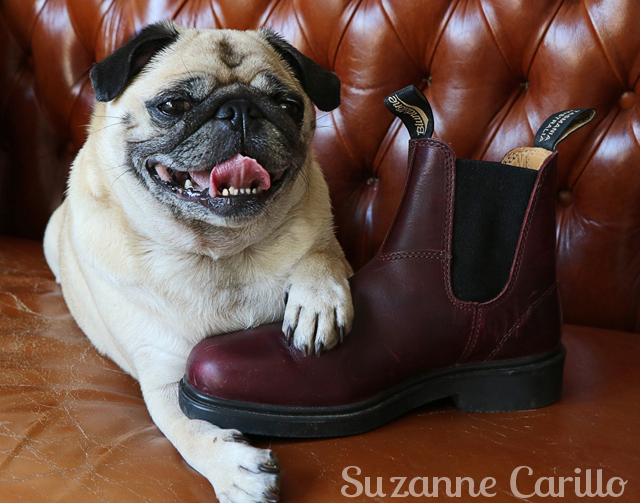 You know how much I LOVE these boots, Suzanne! As you said, style with durability. I love how you styled them too, and having Zoe’s approval, well, what more can you ask? Hahaha!! You should have taken her to the woods as a fake guard dog. And you photos make this treacherous outdoor adventure look like just another leisurely stroll where soon you’ll be whipping out some wine and canapes. Love this post. OH MY GOODNESS! These boots are fantastic! Your photos are superb! And Zoë is a superstar! I often see hip young ‘uns wearing these boots, especially at the farmers markets. I think they are REALLY cool! 🙂 Such a pretty outfit – suits you very well and I love the colors…not just on you. No, I haven’t picked any booties yet. Not a great bootie fan anyway. I’m loving your new boots Suzanne. I think you’re right that they are a styl that will last forever. I’m thinkin they’ll look cute with chubby, warm boot socks or leg warmers scrunched down on them too. 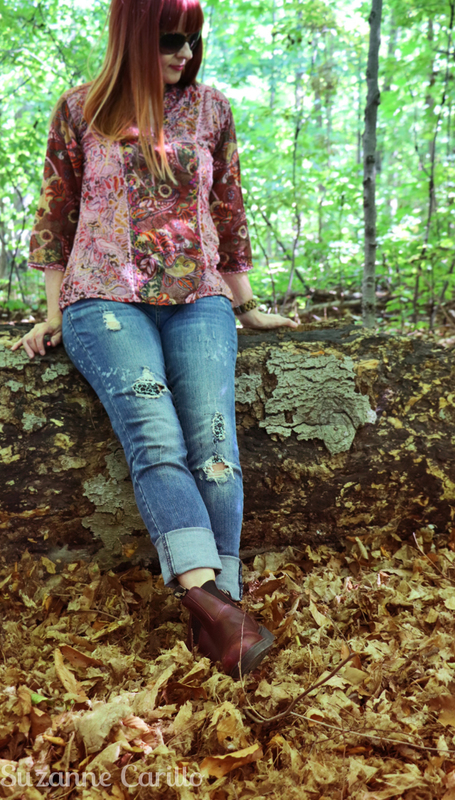 Very cute patchwork fabric , Bohemian style blouse that picks up the rich burgundy of the boots as well. 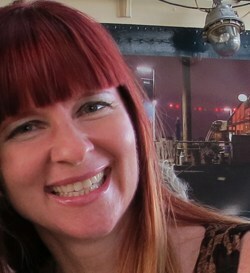 With your beautiful haircolor YOU are a perfect accessory for fall fashion and environmental colors!! I came over from Vix and quite a few people uses these for so called slippers here. They love them!. I have never own any. I’m a yard sale and thrift store shopper. Anyhow you have a nice pug. If you find the time stop in for some coffee. I literally live in my Blunnies! Currently I own 3 pairs but I’ve actually worn out several more. They’re the only thing I can walk miles in. Your dog is so cute. Which makes you even cuter. If Zoe approves of them, what other praise do they need? I have tried Blundstones but they are not comfortable on my feet, however, other people I know swear by them. I usually drool over the Doc Martens at the Queen West Store, which I think is now a Union Jack Boot store (at least it is online). Hope you had a successful weekend at the Vintage Show. Actually I’ve never heard of this brand before but you have me sold. Love the color, the style and the fact that they are comfy, practical and stylish all in one is a great selling point. Great choice in accepting these boots! Haha, I’m not Mariah Carrey! I had to laugh at that one. But very nice shoes, they are very versatile. And your dog is so cute! Boots from Tasmania, wow! I loved the, they do look comfortable and I like the color, deep burgundy, as you said, a color that I like very much. And Zoe approved, so good! She looks so sweet 🙂 I liked the bag! I take a bag to parks 🙂 because of water bottles and some snacks, talk about someone who always needs to drink water 🙂 I even thought I was diabetic 🙂 but thankfully not. I like your attitude to the planet. I didn’t know I was cooperating till I noticed that I am very much into recycling, and I was proud of myself 🙂 Hope you enjoy the new week, dear Suzanne! Bisous! I haven’t heard of this brand before, but they are super cute! Love the color you choose! How did your sale go over the weekend? I seriously like those boots! I really like those boots—they are a little masculine yet you’ve added in the paisley print top for some great yin/yang elements!! And how apropos that you got to go “hiking” in them too! The nice thing about boots is you can hide a couple pair of socks in them for warmth!! Aren’t you a lucky girl. I have had offerings from brands, but only very few and usually not interesting anyway. You, however, lucked out with these cool boots. As Melanie said, you made you adventure look like a walk in the park (oh it was a walk in the park? ? 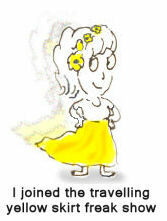 Zoe would have loved to come with you. It is good that she is a dog and doesn’t know what you have been up to or she wouldn’t speak to you for a day. 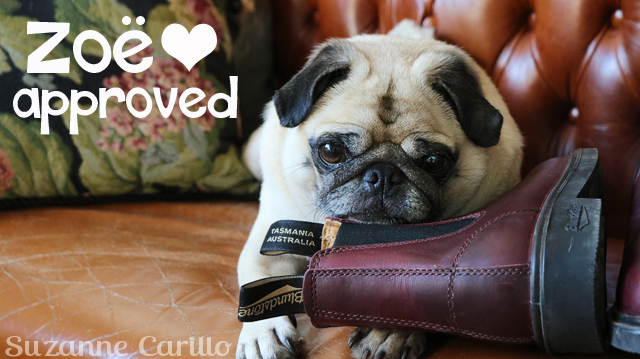 Aw, Zoe and the boots as her chin rest – that is just so utterly utterly adorable! You mean you’re NOT Mariah Carey??? Anyway, what a gorgeous colour those boots are. I would’ve absolutely chosen that colour too and what a great match to your colourful top. And Zoe is the perfect star! 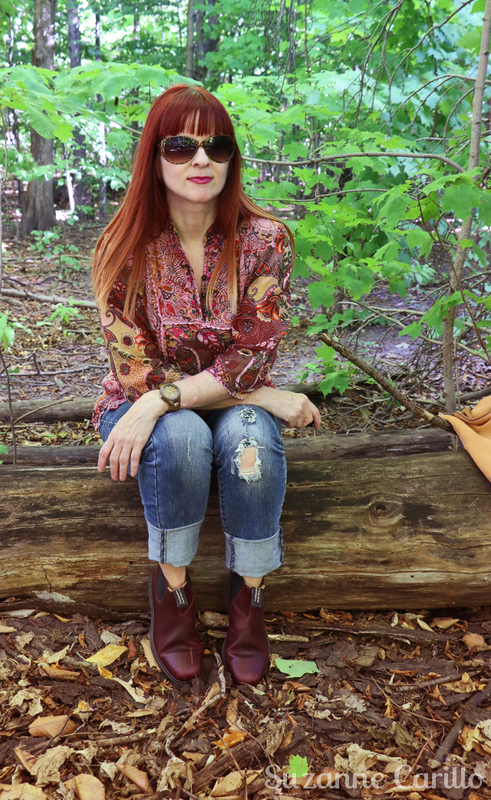 Love the blouse and yes, the boots, super cool, and I agree about the over consumption argument. Zoe is a star and wants you to not forget it! but who is complaining, not moi. LOVE the boots!